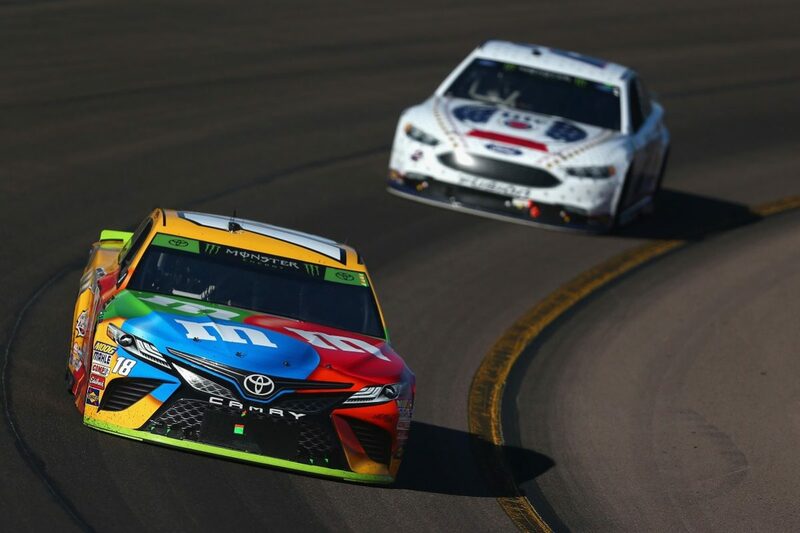 Kyle Busch has qualified for NASCAR’s Championship 4 by winning the Can-Am 500 at Phoenix as Kevin Harvick rallied from a lap down to rescue his title hopes. Harvick and Martin Truex Jnr both earned a Playoff spot at Homestead-Miami on points after a tumultuous week for the former, who lost the benefit of his win in Texas seven days prior due to a technical infringement which also dropped him perilously close to the cutline. He was looking good to put that right in Phoenix until his #4 Stewart-Haas Racing Ford picked up a flat with just laps remaining in Stage 1 of the race. Harvick had led every lap from pole but ceded first position to Chase Elliott moments before the problem became apparent and then dropped off the lead lap. He took the restart for Stage 2 in 29th position but made light work of moving into the free pass position, which paid off when Joey Logano’s left-rear tyre went down and pitched the #22 Team Penske Ford into the wall. Logano was classified 37th at the end, but was already safe by virtue of his win in Martinsville. Harvick went on to finish the stage in fourth position and the eventually race in fifth. Elliott won Stage 1 and held the same position for the restart, but for less than a lap as Kurt Busch got past in the #41 Ford. Clint Bowyer’s championship hopes came to a jarring end on Lap 133 when he too lost a tyre and the #14 Stewart-Haas Racing Ford ended up in the wall, having been running inside the top 10. Kurt Busch, who had by then been leading for 50 laps, responded to the Caution caused by his team-mate by dropping into pit lane but passed the Safety Car in doing so and was penalised. Truex Jnr (#78 Furniture Row Racing Toyota) inherited top spot by staying out but was soon passed by eventual stage winner Kyle Busch. The latter remained on-track in the stage break and led until Lap 225 when Elliott, who had pitted between stages, got by. However, he was penalised only a handful of laps later for speeding in pit lane as he attempted to take advantage of a Caution, leaving Brad Keselowski out in front in the #2 Team Penske Ford. That was until a red flag on Lap 264 when Ricky Stenhouse Jnr clouted the wall and his #17 Roush Fenway Racing Ford dropped oil on the circuit. The subsequent restart accounted for Kurt Busch’s and Elliott’s seasons after Denny Hamlin (#11 Joe Gibbs Racing Toyota) made side-to-side contact with the former as they battled for the lead. Kurt Busch hit the wall then spun down and damage Elliott’s #9 Hendrick Motorsports Chevrolet, bringing an end to the afternoon for Car #41 while Elliott could only finish three laps down in 23rd. Kyle Busch overtook Erik Jones not long after the race got going again and the #18 Joe Gibbs Racing Toyota was not headed thereafter. Keselowski finished half a second back in second position and Kyle Larson (#42 Chip Ganassi Racing Chevrolet) took third. Fourth was not enough for Aric Almirola (#10 Stewart-Haas Racing Ford) to advance but 14th was for 2017 champion Truex Jnr. The 2018 champion will be decided at Homestead-Miami Speedway this weekend (November 16-18 local time).